Compressor stations (which accompany all pressurized pipelines) emit a frightening amount of toxic gases. Check out today’s talking points to learn a little more about this. It’s EARTH DAY! 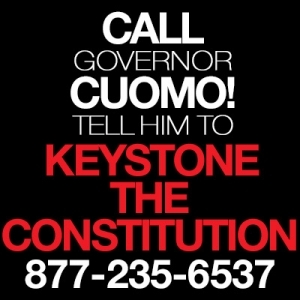 Call or email Governor Cuomo today to wish him a Happy Earth Day. While you’re at it, remind him that fracked gas is just another fossil fuel—in fact, it’s more polluting in the long term than coal or oil. Far from an energy solution, fracked gas and its attendant pipelines and compressor stations will propel us faster toward dangerous climate instability. Today’s message goes out to New York DEC Commissioner Joseph Martens, acting Health Commissioner Howard Zucker AND Governor Cuomo. If these three officials agree that high-volume hydraulic fracturing (aka fracking) is potentially harmful to humans, air and water, how can they in good conscience allow the transport of fracked gas—through massive, high-pressure pipes—next to our homes and through hundreds of New York waterways? Today’s Topic: The “Constitution” Pipeline would carry fracked shale gas—which contains radon—through a pristine part of central New York. Day 13 Call or email NYDEC Commissioner Joseph Martens with today’s message, as well. (518-402-8545; joe.martens@dec.ny.gov) His office—the Department of Environmental Conservation—is mandated to protect our water. Today’s Topic: The massive, high-pressure “Constitution” Pipeline would be extremely vulnerable to rupture during storms and floods. CP would be an environmental disaster for New York. Day 12 Today’s message goes out to both the governor and the commissioner of the New York Department of Environmental Conservation (DEC). Call and/or email them both! Today’s Topic: The “Constitution” Pipeline would be an environmental disaster for New York. CP estimates 7 permanent jobs in New York. This is outrageous. Day 11 Today’s Topic: The “Constitution” Pipeline Company estimates that it would create seven permanent jobs in New York. This is outrageous. Day 10 Today’s Topic: The “Constitution” Pipeline would be dangerous, even deadly, to the people living near it. Day 9 Today’s Topic: If Governor Cuomo allows the “Constitution” Pipeline to be built, it will show the nation that he is not committed to lowering greenhouse gas emissions. Day 7 FERC’s EIS was insufficient by the Environmental Protection Agency (EPA).